In the United States, the rules for ESD testing are introduced by the ESD Association and adopted by the American National Standards Institute (ANSI). Hence, the standards are “ANSI / ESD” standards. Since static exists on the surface of an object, what we want to test anti static mats for is their ability to dissipate static on their top surface or work surface. Hence the title ANSI / ESD S4.1 Worksurfaces – Resistance Measurements. The standard recommends us to perform two types of tests on the top surface of a mat used for static control: a resistance top-to-top (RTT) test, and a resistance-to-groundable point (RTG) test. You can perform both tests with an ESD meter kit. The single most important concept in the field of static control is grounding. Attaching all electrically conductive and dissipative items in the workplace to ground allows built-up electrostatic charges to equalize with ground potential. A grounded conductor cannot hold a static charge. It covers the range of ways that wrist straps, personnel, and mats can be electrically bonded (grounded). An Anti Static Mat with a Wrist Strap bonded at a Common Point Ground Cable snapped into the mat. You should connect all grounded people and equipment to an electrical outlet. Electrical outlets follow the piping to the Earth underneath building. Grounding Cables end in eyelets so that you can tie them into the outlet. When you are wearing a wrist strap or standing on a mat, the force of gravity draws electrons from your body and mats through the grounding cables into the outlet. The electrical field underneath the building is now in balance with you. Garments used for ESD Safety are defined in ANSI / ESD S20.20 2014 as either a “Static Control Garment”, a “Groundable Static Control Garment”, or a “Groundable Static Control Garment System”. Much like a chain-link fence protects a yard, the black conductive carbon fiber in ESD Clothing is woven in a chain-link pattern to protect nearby electronics from electrostatic discharges (ESD). Since ESD clothing is made with carbon woven into it so that it is “static shielding” the primary test of whether or not it qualifies as a “static control garment” revolves around sleeve panel to sleeve panel conductivity. An ESD meter kit is used to perform resistance top-to-top (RTT), and point-to-groundable point (RTG) tests across the panels of an ESD garment. To test heel grounders and wrist straps you would typically use a combo tester at the entrance to a facility. Poster with directions for using the Desco™ Combo Tester is included with parts for assembly. 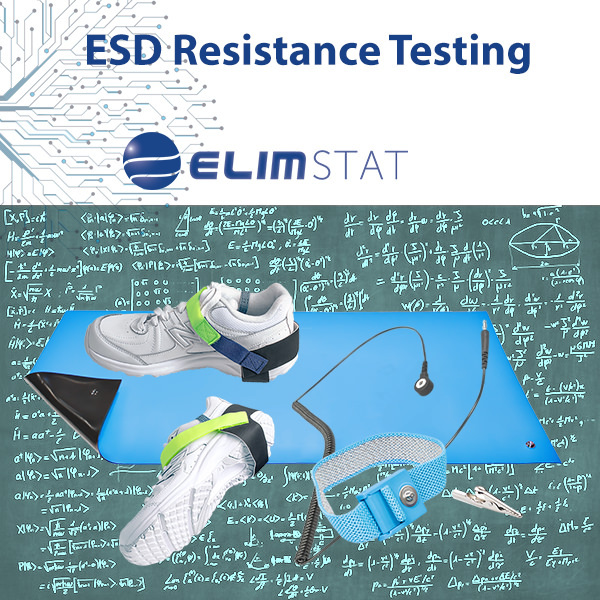 The ESD test equipment, like the combo tester, is itself typically set up to meet the requirements of ESD TR53‘s Wrist Strap and Footwear sections. The testing, therefore, looks for a reading from the wrist strap system of less than 3.5 x 107 (35,000,000) ohms, and a reading from the foot grounder of less than 1 x 109 ohms (1 gigohm).